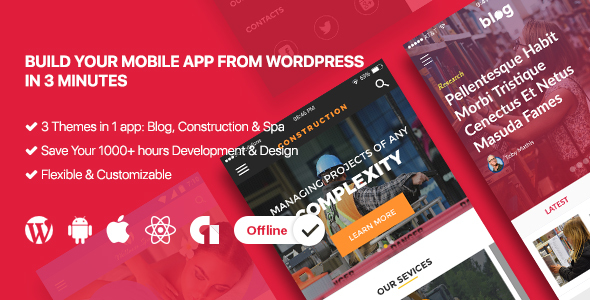 You wants to have a WordPress mobile app for your WordPress site with many beautiful layouts and awesome features such as List layout, Feature post, Article, OneSignal push notification, Google Admob… and much more. Let gikApp for WordPress helps you to do that and save you time up to 100 hours. gikApp for WordPress is an awesome React Native WordPress app that design to help you will turn your WordPress site into an app for android and iOS. We know WordPress, React Native and we know the best ways to get your custom content into an app. If you are an agency or freelancer who want to make apps for your clients faster, this is for you. Produce high quality and customize as much as you want. - Hot fix: the issue "use of undeclared identifier RCTI18nUtil"
→ please choose TechStore - React Native eCommerce Mobile App for Shopify  instead of this. - Redesign Blog theme as default theme. - Add new Construction company theme.